Apartment, 2 Bedrooms, 1 Bath, (Sleeps 4). Quick and easy travel to London without the expense and congestion of a central location! Our home away from home is a clean, roomy and comfortable two-bedroom flat with separate living and dining areas, a fully equipped kitchen, washer/dryer, and free high speed wireless internet. There is a new flat screen HD TV that receives over 100 channels, and a 'multi-region' DVD player that will play your DVDs, no matter where they are from. Our DVD collection includes many movies with an English theme. We are located in a quiet SE London suburb, facing a lovely park and surrounded by Victorian houses. An easy three minute walk leads to the rail station, where frequent trains take you to Victoria Station in central London in just 18 minutes. From Victoria there are extensive Underground links to virtually anywhere in the city. An inexpensive “day travelcard” pays for the round trip train ride to London and also allows unlimited travel on the Underground and on all buses. A short walk from the flat brings you to grocery stores, restaurants, and pubs. Apartments like this in the city center typically rent for substantially more than what we are charging. So why is ours so much less? Though we actually prefer living a bit outside the hassle of central London, many tourists want to be right in the thick of things. So our fees are considerably less in part to make up for the 18-minute train ride to the city. Secondly, the decor and furnishings are traditionally British, not upscale and touristy. And the common areas aren't plush--the stairs aren’t carpeted, there is no elevator, and at the entrance you'll be greeted by recycle bins rather than a doorman! When we travel in Europe we always seek 'value apartments' like ours--we’re looking to rent our flat to like-minded people who appreciate a clean, comfortable and very well-equipped place to stay as a base for exploring London but don't require upscale, luxurious accommodations. Note that the flat is on the 'first floor,' that is, one floor up from the ground level. There is no elevator so you must be prepared to walk up a flight of stairs with your luggage. We maintain a strict no-smoking policy..
We lived in London for five years before moving to Seattle, Washington, USA. We like to travel back to London at least once a year--this flat is our cherished second home, not an 'investment property.' While at the flat we often rendezvous with family from Germany and love to have our grown kids come too. While we're not there we like to make it available to others at a very favorable rate. Beckenham, Bromley is a quiet, safe suburb near to downtown London. It's a real community that's not at all touristy, so it's a nice antidote to the bustle of central London. Because it's so close to a rail station, with frequent service directly to central London, it has all the benefits of a convenient location with less noise and expense than living right in the city. We love being in a small vibrant multi-cultural community with a park directly across the street and grocery stores, ATMs, pubs and restaurants within easy reach. With only a three-minute walk to the train station it couldn't be more convenient! Secure, reliable high speed free Wi-Fi is included. There is a new microwave oven, new fridge/freezer, 4-burner stove top and oven, electric kettle, and coffee maker. We have a selection of CDs, with many types of music. Stocked with DVDs,many with an English theme. Our DVD player is "multi-region," so you can bring your own DVDs with you. They will play fine whether from N America, Europe, or Asia. ALTHOUGH WE WERE OVER IN ENGLAND FOR THE FUNERAL OF A CLOSE RELATIVE, WE HAD A VERY PLEASANT STAY HERE IN THE WEEK BEFORE CHRISTMAS. THE APARTMENT IS SPACIOUS, WELL MAINTAINED AND PARTICULARLY WELL EQUIPPED. THERE ARE THREE RAILWAY STATIONS CLOSE BY WITH DIRECT SERVICES INTO CENTRAL LONDON OR SOUTH INTO KENT AND ITS MANY PLACES OF HISTORICAL INTEREST. THERE ARE LOCAL SHOPS CLOSE BY OR A LITTLE FURTHER INTO BECKENHAM ITSELF WITH TWO BIG SUPERMARKETS AND MANY GOOD RESTAURANTS AND PUBS. SID AND PATRICIA TUPPER, TORONTO, CANADA. Really enjoyed our stay. Very convenient to transportation and a lovely flat. This flat was perfect for our stay. Plenty of room for all of us to relax before and after exploring the city; much better that a hotel room and less pricey. The owner provides a very detailed guide with instructions about how to operate everything in the flat, plus directions and recommendations for where to go and what to do in and around the area. Very nice suburban neighborhood; easy and safe for walking. We loved the Moon and Stars... family-friendly, good food and more affordable than the pubs in the city. The train station is a just a block away with a short ride into Victoria station. We'll definitely stay here again if we make it back to London! I recently stayed in this cozy two bedroom flat with my two sons for close to 8 weeks beginning In late October of 2015. We could not have imagined staying in a more peaceful and secure offering for our London adventure. The flat is just a three minute walk to Kent House Station where every 15 minutes a train brings you to Victoria Station in just 20 minutes. New Beckenham Station is just a 9 minute walk and brings you to London Bridge. The flat delivers all the comforts of home in a very traditional English fashion, and the owner is remarkably attentive. It's quite quiet and welcoming once inside. The owner doesn't live nearby, but has a very responsible nearby contact who was prompt in her assistance at getting us into the flat. There was also a very detailed information document with all of the pertinent need to know items clearly and concisely described. I can't say enough about how happy we were with this flat. We bought our groceries in nearby Penge at just an 8 minute walk. The flat was a wonderful place to rest after a day exploring London. There is a good sized flat screen TV with plenty of channels, and the kitchen is very well stocked. We won't hesitate to stay here again when we return. It was perfect for us. The owner couldn't have been more professional and courteous. I highly recommend this flat for all who wish to see London with ease, but without the excessive cost of being downtown. This is a wonderful site for visitors to London! We stayed here for two months in 2015 and also in 2013. 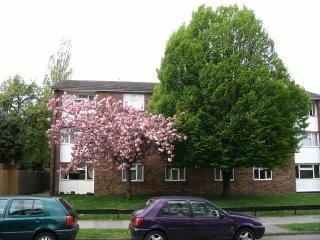 We love this very quiet, comfortable flat in a pleasant residential suburb, with a small park right across the street. There is a train station a 5-minute walk from the flat, where you can catch a train to central London, a 20-minute ride. The owners provide a very helpful guide with, along with instructions for how everything in the flat works, numerous suggestions for local restaurants and nearby shopping. We have always found the owners easy and delightful to deal with. We are certainly looking forward to staying here again. We are a family of 4, with 2 kids and we spent a wonderful week in this apartment. Everything was in line with the announcement. The apartment is quiet, very well equipped, with clear and precise instructions, very clean and the owner is very nice and helping. The train station is nearby and access to London very easy. Everything was perfect. We highly recommend this apartment and we'll come back for another stay. There is a large, lovely park directly across the street (see photo). Although our typical guests are focused on London, the nearby towns offer lots of vibrant, multicultural shopping and other activities. The Beckenham-Penge High Street is a 5-minute walk away. A convenience grocery store with extended hours is close by, and a large grocery store is a ten-minute walk. There are many local restaurants; almost all of them will deliver to the flat for no charge (we have an extensive collection of menus available for review, including many very good Indian and Bangladeshi restaurants). A public swimming pool is within walking distance. If you have a car, there is safe off-street parking. It's a short drive to the beautiful Kent and Surrey countryside where you can explore stately homes, castles, and country pubs. The homes of Winston Churchill (Chartwell House) and Charles Darwin (in the village of Downe) are within easy reach. We require a minimum stay of seven nights, but welcome stays of any length beyond a week. The charge is $145/night regular season and $160/night for the high (summer) season. Rate breaks are gladly offered for long stays.